Laura found out she was pregnant in December. “I have a three-year-old son who I have raised essentially as a single parent, and I wasn’t in a position to be a single parent to another child,” the 26-year-old, who lives in Albury on the NSW-Victoria border, told BuzzFeed News. 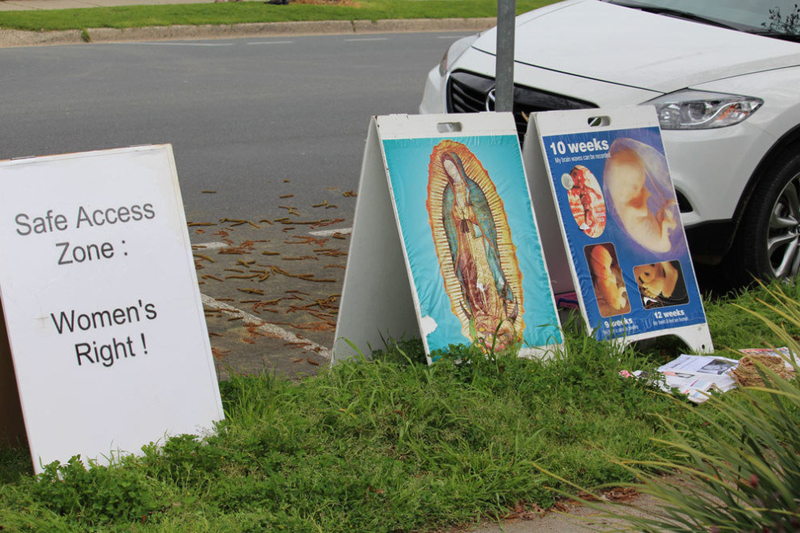 There is only one abortion provider in Albury, a fertility clinic that is only open on Thursdays. Each Thursday morning anti-abortion protesters gather outside with signs and plastic foetus dolls. The dolls are handed to women coming in to the clinic in a bid to dissuade them from having an abortion. One of the regular picketers also sprays “holy water” along the footpath outside the clinic. Laura knew she wanted a surgical abortion. But a member of Laura’s extended family is one of the regular protesters outside the clinic. “I knew I couldn’t go there when a relative of mine was going to be standing out the front of the clinic hassling me not to go in,” she said. Laura feared the man would tell other people in her extended family and friends that she had visited the centre. “No one is stopping [the protesters] from telling other people who they saw there that day, and at the time I was really concerned with people knowing that I was making that decision,” she said. Because Laura was still at an early enough stage of her pregnancy, she was able to opt for a medical abortion instead. Last month she went to the GP to get abortion drug RU486. Abortion is still a crime for women and doctors in NSW and is only lawful if a doctor believes a woman’s physical and/or mental health are in serious danger. Social and economic factors may also be taken into account. Laura has always been pro-choice but said the experience gave her a “different perspective” on the barriers women in NSW face when making decisions about their own bodies. “It seemed really unfair to me because [the clinic] should be a safe place for women,” she said. A bill to decriminalise abortion and enact 150 metre exclusion or “safe access” zones around abortion providers to protect patients against “ongoing harassment, abuse and intimidation” was introduced to NSW parliament by Greens MP Mehreen Faruqi in August. NSW Labor MP Penny Sharpe has also initiated a private member’s bill for safe access zones. Laura supports the move to decriminalise abortion but believes safe access zones don’t go far enough, and that religious protesters should be banned from clinics altogether. “Every woman who faces the same choice has to be handed plastic [foetal] dolls and pamphlets,” she said. About 500 metres south of the clinic, across the NSW border into Victoria, women seeking abortions and staff at fertility clinics no longer have to navigate through protesters to the front door. In 2015 Victoria followed Tasmania and the ACT in passing legislation to establish safe access zones. Why are these killers’ helpers like Laura not locked up?